Note: I have done the following on Windows 10. Now, we will install all the necessary programs. First of all, download apache zeppelin from the official site of apache zeppelin. I have used zeppelin-0.8.0-bin-all.tgz. It includes Apache Spark, Scala, and Python. Unzip it to any folder. After that you can launch zeppelin by calling \bin\zeppelin.cmd from the root of your Zeppelin folder. Wait until the Done, zeppelin server started string appears and open http://localhost:8080 in your browser. If everything is okay, you will see Welcome to Zeppelin! message. Note: I assume, that InterSystems IRIS already installed. If not, download and install it before the next step. So, we have the browser's open window with Zeppelin notebook. In the upper-right corner click on anonymous and after, click on Interpreter. Scroll down and find spark. superserverPort — The superserver port number for the IRIS instance, which is not the same as the webserver port number. 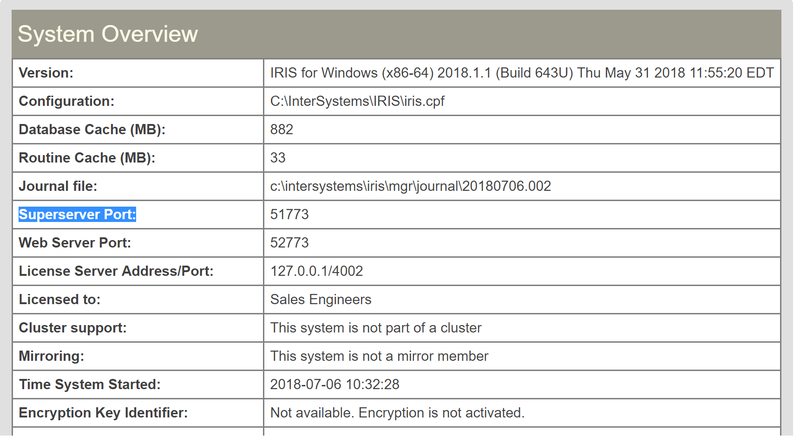 To find the superserver port number, in the Management Portal, go to System Administration > Configuration > System Configuration > Memory and Startup; namespace — An existing namespace in the InterSystems IRIS instance. In this demo, we connect to the USER namespace. Run the paragraph. If everything is okay, you will see FINISHED. In conclusion, we found out how Apache Spark, Apache Zeppelin, and InterSystems IRIS can work together. In my next articles, I will write about data analysis.